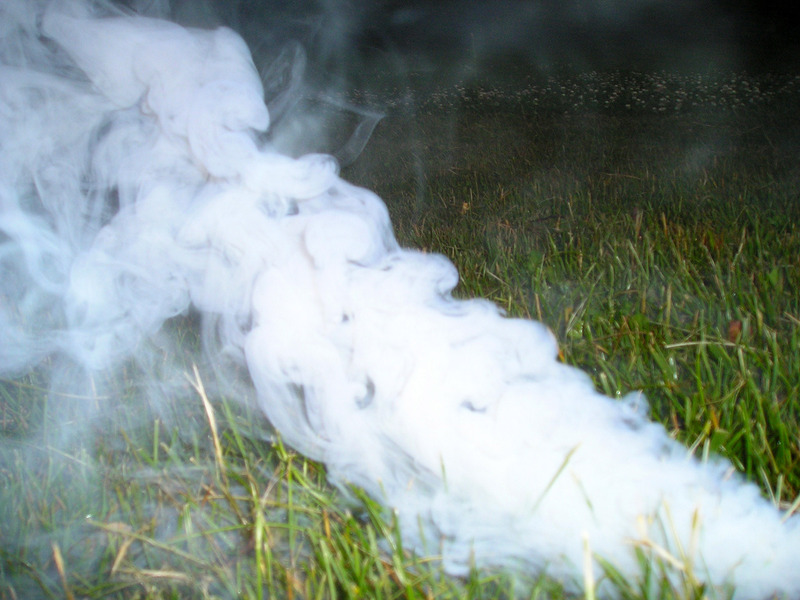 It’s really easy to make a homemade smoke bomb without potassium nitrate or ping pong balls. These instructions are for making a smoke bomb from a cold pack and newspapers. It’s simple and there is no cooking involved. You need ammonium nitrate from a chemical cold pack. If you don’t have one, you can get them at just about any store inexpensively (less than you’d pay for smoke bombs, for sure). Cut open a cold pack, discard the packet of water, and pour the granules into a bucket or large pan. These granules are the ammonium nitrate. Now you have to get the ammonium nitrate into solution so the newspaper will be able to absorb it. Add just enough water to the ammonium nitrate to dissolve the granules. Don’t over do it or you might not get much smoke! You want the chemical to be dissolved, but concentrated. Dip a sheet of newsletter into the ammonium nitrate solution. Let it absorb the liquid about 30 seconds before removing it. The wet newspaper will be fragile, so use care. You may want to fold the newpaper before soaking it to make it easier to handle. Lay the sheet of damp newspaper out to dry. When it is completely dry, roll up the sheet and secure it with tape or string or by twisting the paper. This is your finished smoke bomb. When you are ready to light the smoke bomb, take it outside and light one edge of the rolled up newspaper. Enjoy the white smoke! You might want to wear disposable gloves to avoid touching the ammonium nitrate. If you do touch it, wash your hands to remove it. It’s not particularly dangerous or toxic, but you don’t want to accidentally eat a sandwich with the chemical residue on your hands, do you? If you don’t get a lot of smoke from your smoke bomb, there are two likely causes. First, your paper might not have been completely dry. Second, you might not have enough ammonium nitrate in the paper. Fix this by using less water to dissolve the chemical and by making sure the paper is completely saturated with the liquid before drying it. Try different sizes of paper and folding it different ways. What happens if you crumple the paper into a ball? What factors affect how much smoke is produced? Loosely rolled will emit a flame and burn quickly with out much smoke, if you fold the paper and roll it up then twist it super tight it emits the most smoke. Trial and error.